Would you like to have an email address from your own domain, but prefer Gmail’s interface and integration with Google Docs? Here’s how you can add the free Google Apps Standard to your site and get the best of both worlds. Note: To signup for Google Apps and get it setup on your domain, you will need to be able to add info to your WordPress blog or change Domain settings manually. 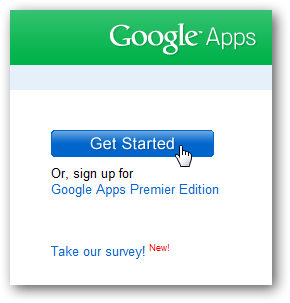 Head to the Google Apps signup page (link below), and click the Get Started button on the right. Note that we are signing up for the free Google Apps which allows a max of 50 users; if you need more than 50 email addresses for your domain, you can choose Premiere Edition instead for $50/year. 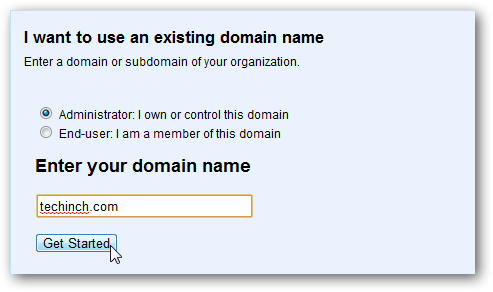 Select that you are the Administrator of the domain, and enter the domain or subdomain you want to use with Google Apps. Here we’re adding Google Apps to the techinch.com site, but we could instead add Apps to mail.techinch.com if needed…click Get Started. Enter your name, phone number, an existing email address, and other Administrator information. The Apps signup page also includes some survey questions about your organization, but you only have to fill in the required fields. On the next page, enter a username and password for the administrator account. Note that the user name will also be the administrative email address as username@yourdomain.com. 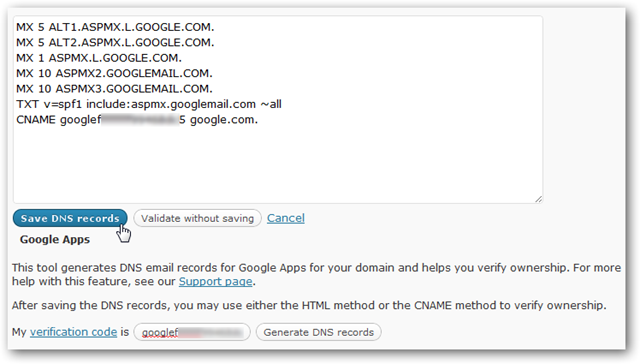 Now you’re ready to authenticate your Google Apps account with your domain. The steps are slightly different depending on whether your site is on WordPress.com or on your own hosting service or server, so we’ll show how to do it both ways. 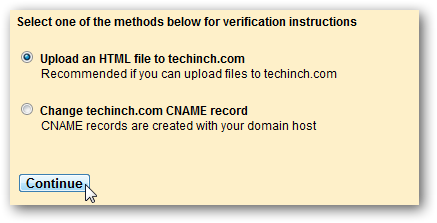 To add Google Apps to a domain you have linked to your WordPress.com blog, select Change yourdomain.com CNAME record and click Continue. Copy the code under #2, which should be something like googleabcdefg123456. Do not click the button at the bottom; wait until we’ve completed the next step. 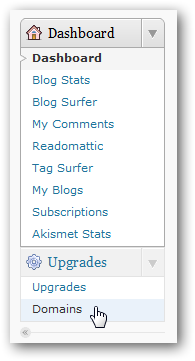 Now, in a separate browser window or tab, open your WordPress Dashboard. Click the arrow beside Upgrades, and select Domains from the menu. Click the Edit DNS link beside the domain name you’re adding to Google Apps. Scroll down to the Google Apps section, and paste your code from Google Apps into the verification code field. Click Generate DNS records when you’re done. 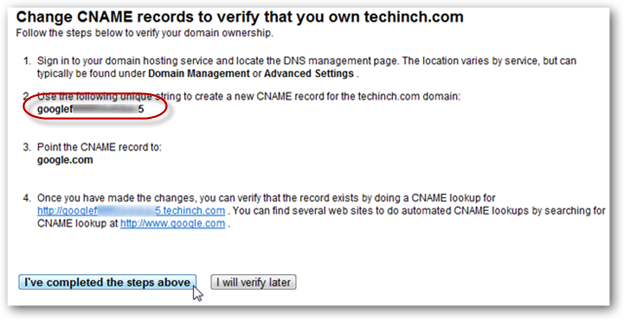 This will add the needed DNS settings to your records in the box above the Google Apps section. Click Save DNS records. Now, go back to the Google Apps signup page, and click I’ve completed the steps above. If your website is hosted on your own server or hosting account, you’ll need to take a few more steps to add Google Apps to your domain. You can add a CNAME record to your domain host using the same information that you would use with a WordPress account, or you can upload an HTML file to your site’s main directory. In this test we’re going to upload an HTML file to our site for verification. Copy the code under #1, which should be something like googleabcdefg123456. Do not click the button at the bottom; wait until we’ve completed the next step first. Create a new HTML file and paste the code in it. 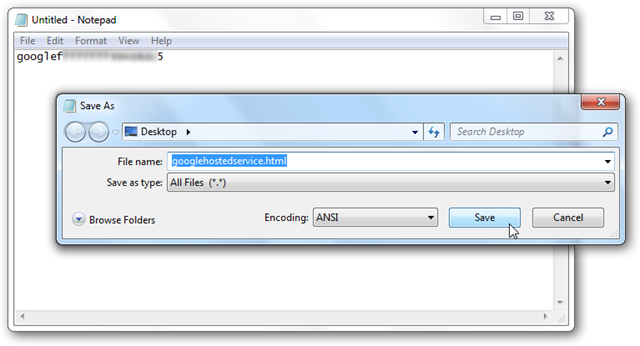 You can do this easily in Notepad: create a new document, paste the code, and then save as googlehostedservice.html. Make sure to select the type as All Files or otherwise the file will have a .txt extension. 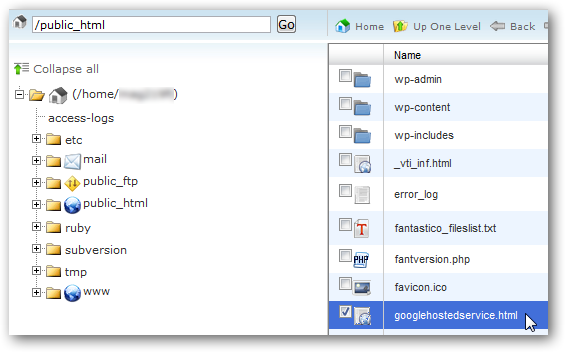 Upload this file to your web server via FTP or a web dashboard for your site. Make sure it is in the top level of your site’s directory structure, and try visiting it at yoursite.com/googlehostedservice.html. When this is done, your Google Apps account should be activated and ready to finish setting up. Google Apps will offer to launch a guide to step you through the rest of the process; you can click Launch guide if you want, or click Skip this guide to continue on your own and go directly to the Apps dashboard. If you choose to open the guide, you’ll be able to easily learn the ropes of Google Apps administration. Once you’ve completed the tutorial, you’ll be taken to the Google Apps dashboard. Most of the Google Apps will be available for immediate use, but Email may take a bit more setup. Click Activate email to get your Gmail-powered email running on your domain. 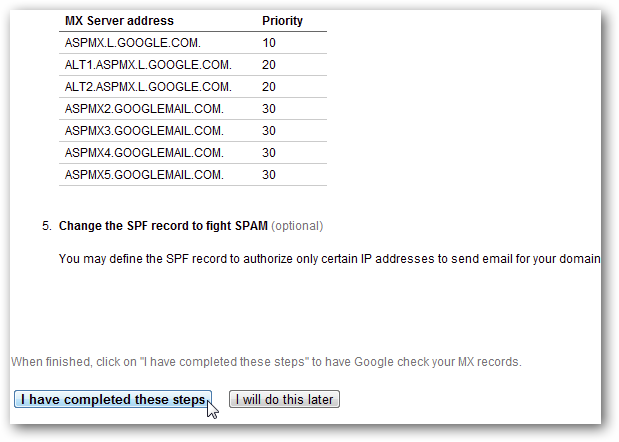 You will need to add Google MX records to your domain registrar in order to have your mail routed to Google. If your domain is hosted on WordPress.com, you’ve already made these changes so simply click I have completed these steps. Otherwise, you’ll need to manually add these records before clicking that button. Adding MX Entries is fairly easy, but the steps may depend on your hosting company or registrar. With some hosts, you may have to contact support to have them add the MX records for you. Our site’s host uses the popular cPanel for website administration, so here’s how we added the MX Entries through cPanel. Login to your site’s cPanel, and click the MX Entry link under Mail. Delete any existing MX Records for your domain or subdomain first to avoid any complications or interactions with Google Apps. If you think you may want to revert to your old email service in the future, save a copy of the records so you can switch back if you need. Now, enter the MX Records that Google listed. Here’s our account after we added all of the entries to our account. Finally, return to your Google Apps Dashboard and click the I have completed these steps button at the bottom of the page. You’re now officially finished activating and setting up your Google Apps account. Google will first have to check the MX records for your domain; this only took around an hour in our test, but Google warns it can take up to 48 hours in some cases. You may then see that Google is updating its servers with your account information. Once again, this took much less time than Google’s estimate. When everything’s finished, you can click the link to access the inbox of your new Administrator email account in Google Apps. Welcome to Gmail … at your own domain! All of the Google Apps work just the same in this version as they do in the public @gmail.com version, so you should feel right at home. You can return to the Google Apps dashboard from the Administrative email account by clicking the Manage this domain at the top right. In the Dashboard, you can easily add new users and email accounts, as well as change settings in your Google Apps account and add your site’s branding to your Apps. Your Google Apps will work just like their standard @gmail.com counterparts. 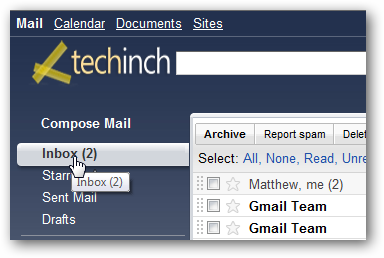 Here’s an example of an inbox customized with the techinch logo and a Gmail theme. Here are the common links to your Google Apps online. Substitute your domain or subdomain for yourdomain.com. Google Apps offers you great webapps and webmail for your domain, and let’s you take advantage of Google’s services while still maintaining the professional look of your own domain. Setting up your account can be slightly complicated, but once it’s finished, it will run seamlessly and you’ll never have to worry about email or collaboration with your team again.